Your group will be amazed with Colorado's scenic and historic rail roads. Experience fantastic landscapes and unforgettable scenery during this once in a lifetime group tour. Take a ride on the Durango SilvertonNarrow Gauge Railroad to see breathtaking mountain views and the Cumbres and Toltec Scenic Railroad to see beautiful meadows and wildflowers. 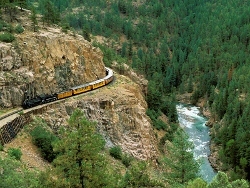 This Colorado Trains Tour is a must do for all tour groups looking for something new & exciting. Visit the World's Greatest Gold Camp in Cripple Creek - a look into the past and an adventure in the present. The Old West flavor and ambience make it a great place for groups to experience the early days of Colorado. Tour Cripple Creek Victor Open Pit Gold Mine. The mine tour is an in-depth tour into the active, open-pit Cripple Creek Victor Gold Mine, which operates 24 hours a day 365 days annually producing over 250,000 troy ounces of gold. You will be in awe of the size of the equipment as you tour (on your bus) through this huge open pit mine. Tour Old Homestead Brothel Museum in Cripple Creek, Another part of the gold story can be found in the last of the famous parlor houses of the Red Light District. The Homestead House was once the most famous brothel in Cripple Creek. Today, the Homestead House is a museum that has been lovingly restored with velvet bedspreads and handmade furniture. Visit Cripple Creek Heritage Center, the perfect place to learn about the area from the geology to flora, fauna, first Native inhabitants, ranchers, mining era,and up to the present with gambling. Exhibits are informational, interpretive and fun! Drive through Rocky Mountains - You will go through small mountain towns, cross the Continental Divide by going through the Eisenhower Tunnel. Follow the Colorado Riverthrough Glenwood Canyon. Alpaca ranch tour - see the barn and the animals and learn about raising the alpacas, Next visit the mini-mill where the wool is cleaned, spun, dyed, etc. Some great items in their gift shop. Wine Pairing Dinner and overnight at The Wine Country Inn. Travel to Ouray, Colorado. Known as "The Switzerland of America" Ouray is a beautiful, tiny town completely surrounded by mountains. Shop for a bit, get a cup of coffee and enjoy the scenery. Travel over the Million Dollar Highway (the most spectacular road in Colorado and always makes the Top Ten of all the "best of" lists for the nation.) You will make a couple of picture stops including an interpretive area that has displays the mining history of the area and you can see buildings dating from the 1860's to the 1950's. The San Juan Mountains are in the most scenic part of Colorado and are made of some of the oldest rock on earth. The Million Dollar Highway carved through sheer rock is both beautiful and breathtaking and follows the same rock ledges carved out by Otto Mears, the Pathfinder of the San Juans, more than a century ago. Ride the Durango Silverton Narrow Gauge Railroadfrom Silverton to Durango. For over a hundred years, the train has wound its way along rock ledges following the Animas River from Silverton to Durango. The little steam engine huffs, puffs and chugs through the spectacular gorges and awe inspiring mountains. Dinner Show offering family entertainment with an old west music and comedy stage show. In Chama, New Mexico, ride the Cumbres and Toltec Scenic Railroad - It is a narrow gauge like the Durango train, the scenery on this ride is very diverse: beautiful meadows, aspen, wildflowers and mountains, crosses Cumbres Pass at over 10,000 feet, some open country with cattle ranches, a deep gorge, and finally out across the high desert country. About half way between Chama and Antonito, the train stops in Osier for lunch included. Tour U. S. Olympic Training Center - The multi-million dollar, 37 acre facility, is the main training center for summer and winter sports. Get a glimpse of the lives, inspiration and dedication of the athletes who compete in the Olympics. Pricing will vary depending on selected travel dates, attractions & hotel choices.